W Bozeman, J Winslow. Medical Aspects of Less Lethal Weapons. The Internet Journal of Rescue and Disaster Medicine. 2004 Volume 5 Number 1. A number of "less lethal" weapons have been developed and are commonly used by modern law-enforcement agencies and some military organizations. The intent of these weapons is to subdue or incapacitate violent or dangerous suspects without causing serious harm or death. Commonly used less lethal weapons include chemical irritant agents, explosive distraction devices, kinetic impact munitions, and electrical incapacitation devices. While less lethal weapons are significantly safer than traditional firearms, no weapon can be entirely non-lethal and no weapon can be made entirely safe. Medical providers may treat subjects exposed to less lethal weapons and should presume injury until proven otherwise. The following is a review article on the medical aspects of less lethal weapons. A number of “less lethal” weapons have been developed and are commonly used by modern law-enforcement agencies and some military organizations. The intent of these weapons is to subdue or incapacitate violent or dangerous suspects without causing serious harm or death. Commonly used less lethal weapons include chemical irritant agents, explosive distraction devices, kinetic impact munitions, and electrical incapacitation devices. While these weapons are not intended to kill, they can and do cause injuries and occasional deaths. Medical personnel will encounter patients who have been exposed to and sustained injuries from these weapons. In this brief review we will discuss each of the above groups of less lethal weapons and their common injury patterns. The nomenclature used to describe these weapons varies. The United States military has adopted the term “nonlethal.” While accurate in conveying the intent of the weapons, this term has been criticized as implying that they do not cause death or serious injury, which is not the case. The term “less-than-lethal” has also been used and is subject to the same criticism. Many authors and users of the weapons prefer the term “less lethal,” which may better convey the weapons' reduced likelihood of causing death or serious injury while not excluding the possibility. The latter term will be used here, but any of the above terms may be treated as interchangeable. One of the most commonly used modern riot control agents is CS, so named after the initials of its inventors. Chemically 0-chlorobenzalmalononitrile, CS is an aerosolized powder (Table 1.) This agent has largely replaced the older and more toxic agent CN (Chloracetophenone) which saw extensive use in the Vietnam conflict of the 1960s, though CN is still available and used by some agencies. Another common riot control agent is Oleoresin Capsicum, abbreviated OC and commonly known as “pepper spray.” Originally derived from hot peppers, modern OC is synthetically manufactured and sprayed from pressurized containers. It is widely available in personal defense sprays. While chemically unrelated to CS or CN, OC produces similar clinical effects and is combined with CS in some products. Irritant agents can be deployed in a number of ways, including hand held sprays, thrown containers similar in appearance to hand grenades, and fired from rifle-like launchers. Containers of riot control agents are conventionally labeled in color coded type to aid in identification. (Table 1.) Some propellants used for riot control agent delivery devices are flammable and may represent an ignition hazard. Numerous preparations of these agents are available to the public in the form of self defense sprays, though law enforcement and military preparations are typically more potent. Patients who have been exposed to riot control agents quickly become acutely uncomfortable and experience an intense burning sensation of the eyes and nasopharyngeal mucous membranes. Lacrimation, blepharospasm, and subjective shortness of breath are prominent. Susceptible individuals may have bronchospasm. Exposed skin may have a burning sensation, and secondary nausea and vomiting may occur. Corneal abrasions can occur after close range exposure to pepper spray powder or eye rubbing. The majority of patients exposed to these agents do not require medical evaluation or treatment. Significant ocular, respiratory, and mucous membrane irritation symptoms resolve in 15-30 minutes without intervention. Skin irritation symptoms may last longer, from 30-60 minutes. In general, treatment of symptoms is supportive, and consists of removal from the offending agent, removal of contaminated outer clothing, exposure to moving air (for example from a small fan), and irrigation of the eyes with water or normal saline (preferred). Topical ocular anesthetics and Morgan lenses are quite effective for eye irrigation, if available. Fluorescein staining can reveal occasional minor corneal abrasions. Beta agonist agents should be considered if bronchospasm is present. Several topically applied “decontaminant” agents are commercially available and advertised to reduce the duration and severity of effects of riot control agents. There are also anecdotal reports that baby shampoo is helpful. However, as yet there have been no published scientific studies that demonstrate their effectiveness. Medical providers should keep in mind that they may become exposed to residual chemical agents from a patient's skin or clothing. Therefore protective gear should be considered and exposed patients' clothing should be removed if the situation and clinical condition allows. Formal decontamination is usually unnecessary but can be considered if high levels of residual riot control agents are present. Specialized explosive devices can be used to temporarily distract and disorient potentially or historically violent suspects. Also called “diversionary devices,” “stun grenades,” or “flash-bangs,” distraction devices explode with a brilliant flash of light and a loud report. These devices are typically used upon initial entry into an enclosed space, to allow entry team members several seconds to enter and secure an area with a decreased risk of resistance. Similar in appearance to hand grenades, these devices are typically deployed by hand. They can also be fired from a distance by a launcher. The explosive force of these devices can cause major injuries if the device detonates in close proximity to a person. In addition to the explosive charge, distraction devices contain powdered magnesium or aluminum, which burn brightly at high temperatures and represent a significant ignition and burn injury hazard. The flash of light produced is intense (over 2 million candlepower) but lasts just 25-90 milliseconds. This is intended to impair vision briefly, but should not cause permanent damage. The explosion typically produces noise of approximately 175 decibels and a momentary pressure wave of 5 - 7 pounds per square inch at 5 feet, the approximate equivalent of a 200 mile per hour blast of wind. This is unlikely to cause damage at distances of 5 feet or greater, but the pressure wave may rupture tympanic membranes and possibly produce other primary blast injuries at closer distances. Burns, soft tissue injuries, bony fractures, and major bleeding can be seen in patients who are in close proximity to or in contact with a distraction device when it explodes. Initial management of these injuries is straightforward, though not always easy. Medical personnel should be sure to examine tympanic membranes for possible injury in such patients, and should consider evaluation for occult blast injuries such as pulmonary contusion or GI tract injuries in selected patients. Secondary injuries from falls or secondary projectiles propelled by the blast should also be investigated. Another type of kinetic impact munition launcher includes paintball type weapons. These rifle-like devices are based on recreational paintball guns and powered by compressed air rather than explosive charges. They fire hollow circular plastic projectiles that are designed to rupture upon impact and release their contents. For law-enforcement use the projectiles may contain OC (oleoresin capsicum) powder or a colored marking powder. The medical effects of the OC payload are discussed above. Figure 1: Contusions from kinetic impact munitions. Another risk of these projectiles, specific to those fired from shotguns, comes from the possibility of accidental substitution of a standard shotgun round for the less lethal ammunition. This has occurred in at least two cases. To reduce the risk of this occurrence, many police agencies that utilize the 12 gauge shotgun launching platform use specially marked weapons that are dedicated to less lethal ammunition use. Evaluation of any patient who has been struck with a less lethal kinetic impact projectile should include a careful history and physical examination directed toward revealing underlying injuries. Standard trauma evaluation including X-rays, computed tomography, and ultrasound examinations as indicated can facilitate the diagnosis of the numerous potential injuries that may have been sustained. Careful attention should be paid to the possibility of penetrating injuries related to these projectiles. Secondary injuries caused by falling, a common occurrence after being struck with one of these munitions, should also be specifically sought. Traditional treatment of blunt and penetrating injuries is indicated. A unique class of weapons, battery powered electrical incapacitation devices deliver a low current, high voltage electrical charge to temporarily incapacitate a suspect. Early “stun gun” devices relied on a painful stimulus alone, while more modern devices also produce tetany of major muscle groups for the duration of electrical current flow. Several devices are now available, though the Taser® M26 and X26 devices are perhaps best known and most commonly used (Figure 2). The electrical shock delivered by these devices is acutely uncomfortable and usually causes tetany of large muscle groups. These symptoms resolve immediately upon cessation of the electrical shock. There is no loss of consciousness or alteration in awareness during the shock. It is common for subjects to fall during or just after use of this weapon. This may produce secondary injuries from blunt trauma. The Taser produces a current of 0.36 - 1.76 joules per pulse. This is well below generally recognized ventricular fibrillation thresholds and is not expected to affect cardiac conduction. Animal studies have demonstrated a significant safety margin for the pulses, with a 15-fold to 42-fold increase in current required to affect cardiac rhythm, depending on the body size. No dysrhythmias have been produced in small studies of healthy volunteers. Further, no Taser-related dysrhythmias have been documented in tens of thousands of training exposures and “real world” deployments by law enforcement. However, the high voltage / low amperage pulsed electrical waveform produced by these weapons is unique, its human effects have not been fully characterized, and concerns about electrical safety have not yet been fully addressed. Imbedded Taser probes can be removed from most areas by using one hand to stretch the skin surrounding the probe taut and the other to remove the probe with a rapid firm pull. Minor puncture wounds and superficial burns are easily treated with cleansing and topical care. Additional care is needed for probes with possible ocular, genital, or vascular penetration and specialist consultation may be required for removal. Secondary injuries due to falls should be specifically sought by history and physical examination. The need for 12 lead EKG assessment after Taser exposure is somewhat controversial. Cardiac effects, if any, would be expected concurrent with or immediately after electrical shock. Thus, an EKG performed minutes or hours after Taser exposure would be unlikely to reveal any Taser-related effects, especially in asymptomatic patients. However, until further information is available, EKG assessment may be prudent in elderly patients, those with a cardiac or drug use history, or those reporting symptoms that could be cardiac in nature. At the time of this writing there is concern and discussion about the safety of electrical incapacitation devices. This is based on a number of unexpected deaths in police custody that have occurred after exposure to the Taser. Most of the deaths have been attributed to drug overdose and none have been attributed solely to the Taser. It is unclear whether the deaths are purely due to drug overdose or to a syndrome of “excited delirium” that has become a leading theory of unexpected death in police custody. [32,33,34] It is also unclear whether the Taser exposure was a contributing factor or not. Several recent reviews have addressed the topic of Taser safety based on currently available information. These reviews indicate that the risks of electrical incapacitation devices are, at most, very low. [35,36,37,38] Only well designed future research will be able to definitively address safety questions related to these weapons. Such research is urgently needed. While less lethal weapons are significantly safer than traditional firearms, no weapon can be entirely non-lethal and no weapon can be made entirely safe. Medical providers may treat subjects exposed to less lethal weapons and should presume injury until proven otherwise. They should be familiar with less lethal weapons' actions, effects, and typical injury profiles. Sonic weapons, olfactory deterrents, directed microwave energy weapons, and a number of other less lethal weapons are under development. Thorough evaluations of the health effects of these weapons should be performed during development and after deployment of the weapons. This will allow full assessment of their risks and benefits. It will also allow medical providers to determine the injury patterns associated with new weapons and help minimize morbidity and mortality due to their use. 1. Smith, J. and I. Greaves, The use of chemical incapacitant sprays: a review. J Trauma, 2002. 52(3): p. 595-600. 2. Wilkinson, D., PSDB Further Evaluation of Taser Devices. 2005, Hertfordshire, United Kingdom: Police Scientific Development Branch. 3. Mesloh, C. Taser Deployments and Injuries: Analysis of Current and Emerging Trends. in Proceedings of the 2004 SWAT Roundup. Nov. 2004. Orlando, FL. 4. Brown, L., D. Takeuchi, and K. Challoner, Corneal abrasions associated with pepper spray exposure. Am J Emerg Med, 2000. 18(3): p. 271-2. 5. Horton, D.K., et al., Secondary contamination of emergency department personnel from o-chlorobenzylidene malononitrile exposure, 2002. Ann Emerg Med, 2005. 45(6): p. 655-8. 6. E-Labs, Performance Characterization Study: Noise Flash Diversionary Devices (NFDDs), Final Report, D.o.J.N.I.o. Justice, Editor. 2003. 7. Glasstone s, D.P., The Effects of Nuclear Weapons. 1977, United States Department of Defense and Energy Research and Development Administration. p. 82-98. 8. Steele, J.A., et al., Plastic bullet injuries in Northern Ireland: experiences during a week of civil disturbance. J Trauma, 1999. 46(4): p. 711-4. 9. Kenny, J., Heal, S, Grossman, M, The Attribute-Based Evaluation(ABE) of Less-Than-Lethal, Extended-Range, Impact Munitions. 2001, National Institute of Justice ; The Pennsylvania State University Applied Research Laboratory; The Los Angeles Sheriff's Department. 10. Hughes, D., et al., Plastic baton round injuries. Emerg Med J, 2005. 22(2): p. 111-2. 11. Sheridan, S.M. and R.I. Whitlock, Plastic baton round injuries. Br J Oral Surg, 1983. 21(4): p. 259-67. 12.	de Brito, D., et al., The injury pattern of a new law enforcement weapon: the police bean bag. Ann Emerg Med, 2001. 38(4): p. 383-90. 13. Hiss, J., F.N. Hellman, and T. Kahana, Rubber and plastic ammunition lethal injuries: the Israeli experience. Med Sci Law, 1997. 37(2): p. 139-44. 14. 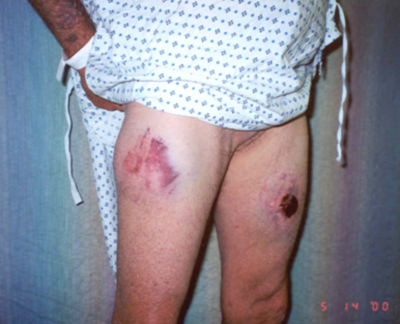 Rocke, L., Injuries caused by plastic bullets compared with those caused by rubber bullets. Lancet, 1983. 1(8330): p. 919-20. 15. Denbam WM, M.W., Injury Patterns Associated with Nonlethal Law Enforcement Techniques. Top Emerg Med, 1999. 19(3): p. 226-229. 16. Suyama, J., et al., Injury patterns related to use of less-lethal weapons during a period of civil unrest. J Emerg Med, 2003. 25(2): p. 219-27. 17. Kester, D., Ijames, S, Patterns of Injury, Recognition, and Treatment for Less Lethal Law Enforcement Techniques. Top Emerg Med, 2003. 25(4): p. 316-325. 18. Chute, D.J. and J.E. Smialek, Injury patterns in a plastic (AR-1) baton fatality. Am J Forensic Med Pathol, 1998. 19(3): p. 226-9. 19. Lavoie, D., College Student dies after police shoot projectile into postgame crowd, in The Boston Globe. 2004, boston.com: Boston, MA. 20. Bir, C. and D.C. Viano, Design and injury assessment criteria for blunt ballistic impacts. J Trauma, 2004. 57(6): p. 1218-24. 21. Charles, A., et al., Penetrating bean bag injury: intrathoracic complication of a nonlethal weapon. J Trauma, 2002. 53(5): p. 997-1000. 22. Grange, J.T., R. Kozak, and J. Gonzalez, Penetrating injury from a less-lethal bean bag gun. J Trauma, 2002. 52(3): p. 576-8. 23. Olivas, T., B. Jones, and M. Canulla, Abdominal wall penetration by a police "bean bag". Am Surg, 2001. 67(5): p. 407-9. 24. Wawro, P.A. and W.R. Hardy, Penetration of the chest by less-than-lethal "beanbag" shotgun rounds. J Trauma, 2002. 52(4): p. 767-8. 25. Sehgal, A. and K.R. Challoner, The Flexible Baton TM-12: a case report involving a new police weapon. J Emerg Med, 1997. 15(6): p. 789-91. 26. Bleetman, A., R. Steyn, and C. Lee, Introduction of the Taser into British policing. Implications for UK emergency departments: an overview of electronic weaponry. Emerg Med J, 2004. 21(2): p. 136-40. 27. McManus JG, F.T., Hawks RW, Jui J, A Retrospective Case Series Describing the Injury Pattern of the Advanced M26 TASER in Multnomah County, Oregon. Acad Emerg Med, 2004. 11(5): p. 587. 28. Bozeman, W.P., Medical threat assessment: The Taser M26 less lethal weapon. The Tactical Edge, 2003. 29. McDaniel, W.C., et al., Cardiac safety of neuromuscular incapacitating defensive devices. Pacing Clin Electrophysiol, 2005. 28 Suppl 1: p. S284-7. 30. Levine SD, S.C., Chan T, Vilke G, Dunford J, Cardiac Monitoring of Subjects Exposed to the Taser. Acad Emerg Med, 2005. 12(5 Suppl 1): p. 71. 31. Excessive and lethal force? Amnesty International's concerns about deaths and ill treatment involving police use of tasers. 2004, Amnesty International USA. 32. Lauer, D., Excited Delirium and its Correlation to Sudden and Unexpected Death Proximal to Restraint: A Review Of The Current and Relevant Medical Literature. 2004, Victoria Police Department: Victoria, BC, Canada. 33. Ross, D.L., Factors associated with excited delirium deaths in police custody. Mod Pathol, 1998. 11(11): p. 1127-37. 34. Stratton, S.J., et al., Factors associated with sudden death of individuals requiring restraint for excited delirium. Am J Emerg Med, 2001. 19(3): p. 187-91. 35. McBride DK, T.N., Efficacy and Safety of Electrical Stun Devices. 2005, Potomac Institute for Policy Studies: Arlington, VA.
36. Maier A, N.P., Price P, Sherry CJ, Reilly JP, Klauenberg BJ, Drummond JT, Human Effectiveness and Risk Characterization of the Electromuscular Incapacitation Device - A Limited Analysis of the TASER. 2005, Joint Non-Lethal Weapons Human Effects Center of Excellence. 37. TASER Task Force Medical Findings. 2004, Orange County Sheriff's Office Florida: Orlando, FL. 38. Battershill P, N.B., Laur D, Panton K, Massine M, Anthony R, Taser Technology Review & Interim Recommendations. 2004, Office of the Police Complaint Commissioner: Victoria, British Columbia. 39. Taser Injury Reduction. 2005, Taser International (http://www.taser.com/facts/stats.htm). 40. The Effectiveness and Safety of Pepper Spray. 2003, U.S. Department of Justice: Washington, DC. 41.	Pepper Spray Evaluation Project: Results of the Introduction of Oleoresin Capsicum (OC) into the Baltimore County, MD, Police Department. 1995, International Association of Chiefs of Police and the National Institute of Justice U.S. Department of Justice.